The New York Times calls Turkish writer Asli Erdogan one of the "11 Powerful Women We Met Around the World in 2017"
Three interconnected stories feature women whose lives have been interrupted by forces beyond their control. Exile, serious illness, or the imprisonment of one's beloved are each met with versions of strength and daring, while there is no undoing what fate has wrought. 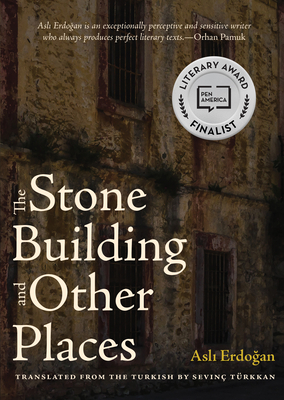 These atmospheric, introspective tales culminate in an experimental, multi-voiced novella, whose "stone building" is a metaphor for the various oppressive institutions--prisons, police headquarters, hospitals, and psychiatric asylums--that dominate the lives of all of these characters. Here is a literary distillation of the alienation, helplessness, and controlled fury of exile and incarceration--both physical and mental--presented in a series of moving, allegorical portraits of lives ensnared by the structures of power. Aslı Erdoğan (Istanbul, 1967) was arrested and imprisoned by the Turkish government in a sweeping roundup of dissident voices after the failed coup attempt of July 2016. The subject of both PEN International and PEN America advocacy campaigns, she has published novels, collections of short stories and poetic prose, and selections from her political essays. As a journalist, she has covered controversial topics such as state violence, discrimination, and human rights, for which she has been persecuted in a variety of ways. Asli Erdogan (who is no relation to Turkish President Recep Tayyip Erdogan) is a renowned novelist, columnist, and human rights activist. She was born in Istanbul in 1967. She studied computer engineering and physics, and wrote her dissertation at the European High Energy Physics Laboratory. She quit her graduate work in physics in Rio de Janeiro and devoted herself entirely to writing. She lived for two years in South America. Her first novel Kabuk Adam ("The Scab Man") was published in 1994; her short story collection Mucizevi Mandarin ("The Miraculous Mandarin" was published in 1996. Her short story "The Wooden Birds" received the Deutsche Welle literary prize and was translated into nine other languages. Her second novel The City of Crimson Cloak (1998) appeared in English, French, and Norwegian; and was published by Actes Sud and Gyldendal's "Marg" series. Her non-fiction writings were collected in Bir Yolculuk Ne Zaman Biter ("When Does a Journey End?"). She was included in the list of "The Writers of the Next 50 Years" by Lire magazine and her book of poetic prose Hayatin Sessizliginde ("In the Silence of Life") was selected the book of the year by Dunya Publishing. Her two essay collections Bir Kez Daha ("Once Again") and Bir Delinin Guncesi ("A Diary of a Madman") were published in 2006. She has received numerous accolades in the international press and her works continue to appear in other world languages.